Demetrios Kalamidas: "Prove me wrong--on my own terms!" 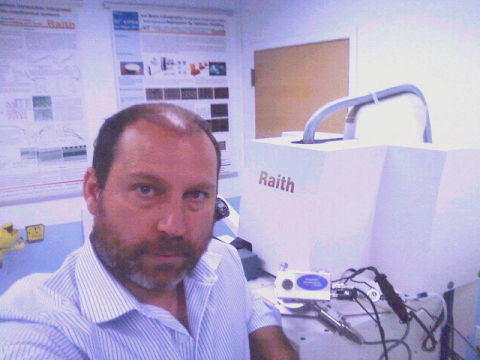 I am no stranger to faster-than-light signaling schemes. I even wrote a book about such schemes. So when I heard about Demetrios Kalamidas's clever and original FTL signaling proposal, I jumped right in--both in trying myself to refute his scheme and urging other physicists to do so too. Only a few physicists took the bait but they were a prestigious crew: Gian-Carlo Ghirardi of quantum-collapse-model fame, Christopher Gerry, author of a respected quantum-optics textbook, John Howell at University of Rochester, a school famed for its optics discoveries and its association with Eastman Kodak, and Martin Suda at the Austrian Institute of Technology in Vienna. Each of these four men and myself took a different path and we soon produced 5 different refutations of the Kalamidas proposal. As explained by John Howell, there are two basic ways to refute such a scheme--using photon operator calculus or using wavefunctions. Ghirardi, Howell and Gerry chose the more elegant operator mode while Suda and I calculated the wavefunctions. Although differing in details, all of our refutations have one thing in common. They are very general refutations -- with no approximations. It is obvious that if the exact Kalamidas scheme won't work, then any approximation scheme must fail as well. Kalamidas was impressed by the variety of our refutations but he refused to entirely surrender until one condition was met. "Show me where I went off the tracks," he asked. "If you are all so sure that you have proved that I am mistaken, then it should be 'easy pickins' for one of you to point out exactly where I went wrong". Nobody took up the Kalamidas challenge -- probably because they had more important work to do. Since my life at the quantum tantra ashram requires lots of free time, I decided to calculate the result of the Kalamidas experiment on his own terms, to see if indeed it would be 'easy pickins' to find his mistake. I did the calculation. But it would not have been easy pickins had I not learned so much exotic photon algebra from John Howell and Martin Suda, particularly the basic orthogonality relations between photon-added coherent states, displaced-Fock states and garden-variety coherent states. Using these orthogonality relations, the Kalamidas calculation becomes easy--anyone could do it. In Kalamidas's calculation he produces an interference term  which if uncanceled would indeed lead to superluminal signaling. However, as part of his calculation he throws away terms that he plausibly argues are "vanishing". Demetrios's mistake was in throwing away these terms. They do not vanish and when reinstated they demonstrate why the Kalamidas scheme doesn't work. Calculating the "vanishing terms" produces two anti-interference terms  and , each of which by itself suffices to cancel out Kalamidas's  term. However, if that were the end of it, the Kalamidas scheme would still work, because now one of the anti-interference terms remains uncanceled and could itself be used for superluminal signaling. Fortunately for the fate of the world (superluminal signaling would seriously disrupt the world of physics and eventually mess up ordinary life as well)... Fortunately for the fate of the world, the "vanishing terms" produce a second interference term  unnoticed by Kalamidas. 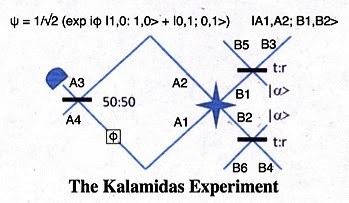 Now the two interference terms  and  are exactly canceled by two anti-interference terms  and  so that the "Kalamidas effect" disappears completely--on Kalamidas's own terms at Kalamidas's own level of approximation. A pdf file of this new refutation (including references to the work of Ghirardi, Gerry, Howell and Suda can be found here. The  term, first uncovered by Martin Suda, seemed to lack a clear physical justification. We now realize that the  term is a simple consequence of the HOM effect.